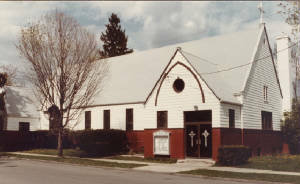 On the evening of June 10, 1892, a small committee from Hedding Methodist Church, near downtown Elmira, met for the purpose of establishing a Mission Sunday School in the western part of Elmira. A barn on Foster Avenue, between West Church and West First Streets, was chosen and rented for $1.50 a month. The structure was renovated, and on July 22, 1892, the school welcomed its first pupils - 22 in number. The school grew quickly and soon the building proved to be inadequate. In 1893 a fund was quickly raised from residents and interested friends of the small but growing Westside. Of this fund, $450 was used to purchase a lot at the southeast corner of Foster Avenue and West First Street from Matthias H. Arnot, and $2000 went into the construction of the Foster Avenue Chapel. The new chapel, dedicated in 1895, served for a number of years as an outpost for Hedding Methodist Church, with a flourishing Sunday school and an active Ladies Aid. Leaders in this early development of Westside were A. O. Adams, Casper G. Decker, Joseph Pierce, and a number of ladies of the community who constituted the Foster Avenue Ladies Aid Society. On December 19, 1915, the Rev. George Y. Benton assumed charge of the Sunday school and weekly prayer meeting. 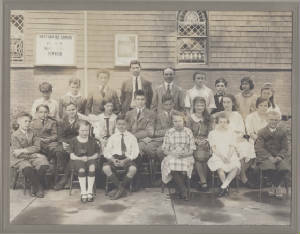 The Sunday school was held in the afternoon, and 28 were present on that first Sunday. The organization progressed rapidly. Soon its members expressed a desire for an independent church organization. 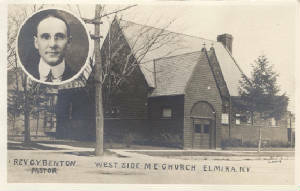 In October 1916, the Westside Methodist Episcopal Church was organized. Forty-five charter members made up the first congregation, composed of Baptists, Presbyterians, Congregationalists, Episcopalians, and Lutherans, as well as Methodists who had attended the Sunday School. Rev. 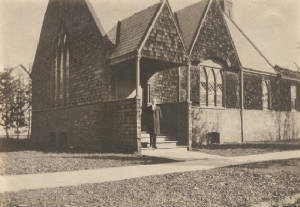 Benton was appointed pastor and the society was granted the use of the chapel. The church was incorporated on August 8, 1917. By the end of the first year, the church membership had grown to 135 members and the Hedding trustees deeded the chapel to the new congregation. $2500 was spent in repairing and remodeling the structure. By 1919 this amount had been paid and Westside was free from debt. The membership at this date was 212. In 1920, expansion became necessary, and at the Fourth Quarterly Conference held August 5, 1920, the problem was resolved. It was decided to enlarge the existing building by fifty percent in order to create more Sunday school space and more room for social events. The enlarged building was ready for use in January of 1921. Several years later, three rooms were added on the east side of the church and the basement was dug out further. This provided more room, including a nursery, for the Sunday school. 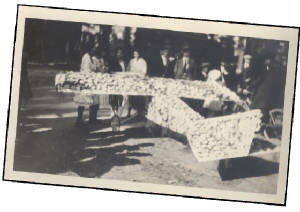 “HUNDREDS MARCH IN PARADE OF SUNDAY SCHOOL MEMBERS; MANY FLOATS ARE FEATURED. Displaying a beautiful floral decorated airplane model with a pretty little child occupying the driver's seat, the Westside Methodist Sunday School won the greatest applause for the most original and charming float in the annual Sunday School parade, held Sunday afternoon, September 17. The float was designed by Daniel Hungerford, an airplane builder and flyer. Earl Boone, son of Mr. and Mrs. H. S. Boone of 712 West Second Street, occupied the pilot's seat. “The parade was viewed by hundreds of people all along the line of march. The children marched to Hoffman Park, where they congregated about the pavilion and joined in singing. “Many of the floats were prettily decorated and all deserve special praise. The American flag was flowing from the deck of the major portion of them, while draped bunting hung from the sides. “The combination float and cradle roll of the Westside Methodist Episcopal Church caused much favorable comment. It was drawn by several little girls attired in white. Master Boone was attired in a regular white aviator's costume. “The adult classes of the various Sunday Schools also made an excellent impression. At the head of each church delegation the pastor and Sunday School heads of that church marched, followed by the adults and the children. The original church parsonage was at 741 W. Church Street. In 1922, Westside purchased the parsonage at 744 West Church Street from Archie Haskins at a cost of $10,500. The mortgage on the church was paid in 1925 and burned at a celebration. Two members gave $1000 each and the church raised the rest. During the Great Depression, it was suggested that Westside build a new church further west to reach the residents of that section of the city. A lot at the corner of West Church Street and Demarest Parkway was purchased, but the worsening economic crisis put a halt to relocation plans. Despite tough financial times, new pews were purchased for the sanctuary in the mid-1930s. By this time, Westside had more than 15 active organizations, including youth programs, a women’s society, Boy Scout Troop #48 and Cub Scout Pack #48, and various religious education programs. 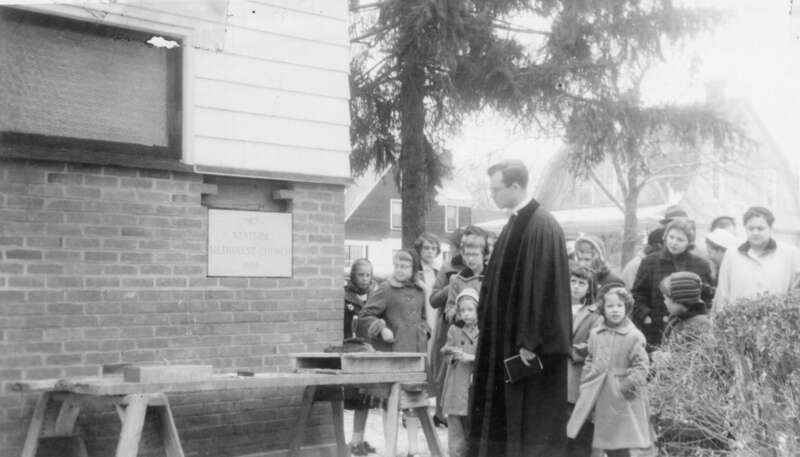 In 1951, the increased Sunday school attendance made mandatory the first steps toward enlarging the church. Crowded conditions made it difficult to give the children proper attention. There was no way to separate the children into classes where best results could be attained. The Building Committee spent many hours working on plans to take care of the expansion requirements as they saw them at that time and a drive for pledges for the Building Fund was organized and conducted. Within two years more than half the money pledged had been paid Spring of 1954 was set as a goal for breaking ground. But during the waiting period, conditions changed and the requirements were not the same as when the first plans were adopted. Not only was it necessary to increase the amount of Sunday school space, but the increasing attendance at church pointed to the need for additional space in the sanctuary. The building plans had to be changed, new estimates procured and financing arranged. The new plans provided 15 classrooms for the Sunday school, a seating capacity of 208 in the Sanctuary, additional space for 60 to 70 persons in the adjoining Sunday school rooms for overflow crowds, and room for 24 in the choir loft. The estimated cost of the building project was $60,000. Ground was finally broken for the addition to the church on Sunday, June 26, 1955. 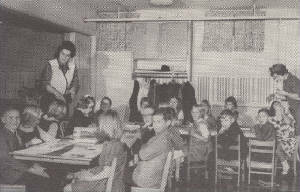 A second building fund drive was made during the first week of November 1955. The goal was $100 per week for 100 weeks. Over $12,000 was pledged. Numerous church activities boosted the building fund. An anonymous person loaned $5,000 interest free. The Central New York Conference donated $5,000 and the National Board of Missions $1,500. The building fund was placed on a sound footing. After a summer of worshipping in a room at the Hedding Methodist Church, Westsiders got a glimpse of the new church for the first time on October 9, 1955. The pulpit, which had been located at the south end of the building, was moved to the north end. A narthex and a new entrance were added to the south end. Also, ten pews were added for additional seating. In the mid-1960s, new glass doors were added to the church entrance and red carpeting was installed in the narthex. A new parsonage was purchased at 740 West Second Street. This served a dual purpose. It provided better housing for the minister and family and made the former parsonage (Wesley Hall) available for Sunday school classes and youth meetings. 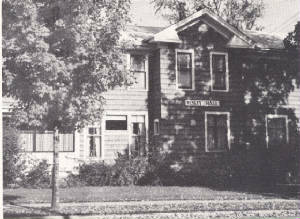 During the early 70s Wesley Hall housed a youth center for all West Elmira teens. “Collage,” as it was named, offered chaperoned fellowship and programs several weekday and weekend evenings. It was a popular place for teens to gather. The women of the church used Wesley Hall as a place for meetings and to do sewing/craft projects for the bazaars. It was also used briefly for church office space. Due to maintenance expenses for the aging building it was razed around 1976. Early in 1967, merging Westside with Hedding, First, and St. John’s Methodist Churches was given careful study and consideration. A vote of Quarterly Conference expressed confidence that Westside has a definite mission to fill in the surrounding community and a determination to keep Westside strong and growing. Fun and fellowship have always been important to the congregation at Westside. In the 1980s, church members formed competitive softball and bowling teams, with both doing well, garnering trophies! “Progressive Dinners,” where several members each host a different course in their homes, have been occasional gathering opportunities over the years. A very active United Methodist Women’s group held annual Christmas bazaars, featuring Westside’s homemade peanut brittle, fudge, handicrafts, and various other items as fundraisers. 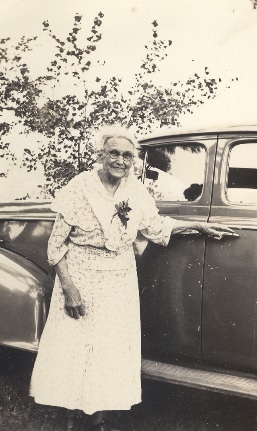 Harvest Suppers, chicken-n-biscuit dinners, and homemade soup sales held by the UMW also received enthusiastic community support and in turn aided community mission work. In 1980, a new tradition began with the first “Westside Sweethearts,” George and Rosalie Lewis. Each Sunday around Valentine’s Day, the chosen Sweethearts are surprised with a shower of cards sent to their home, recognition during the Sunday service and a special coffee hour. In 2017 we honored our 38th “Westside Sweetheart,” Norma Doane. In the late 1990s, the senior members of the congregation organized the “Lunch Bunch” and invited community seniors to join them for fellowship, informative programs and trips to area attractions. And then there is the church picnic. An annual event for many years, the picnic is now held in September celebrating the return of both primary and adult Sunday school classes. In 1983 a steeple with carillon replaced the single cross on the southern rooftop. This became a visual and audio reminder of Westside’s presence and outreach in the community. The carillon bells continue to call church-goers to Sunday services and weekdays plays hymns at 9:00 a.m., 12:00 noon, and 6:00 p.m.
An elevator addition to make the church handicap-accessible meant a bump-out on the south end of the church and the relocation of the nursery room to the Fellowship Hall (utilizing unused classroom space). Year? The old nursery space was converted to a prayer room and serves as a pass-through from the elevator to the Fellowship Hall. Additionally, a handicap-accessible restroom was added to the upstairs necessitating relocation of the choir closet from the church office to an unused classroom area of the Parlor, with permanent walls being installed. More recently, the sanctuary was painted off-white, a major change from its previous long-time pale pink color. The Fellowship Hall and nursery were also renovated with the accordion divider doors removed, a contemporary paint job, and a children’s Sunday school room and nursery added with permanent walls and French doors. A colorful mural was painted on one entire wall of the nursery in 2016. Westside entered the high tech age in the 2000s. The carillon was updated from the old cartridge-style taped music to digital to provide more hymn options and an easier method of programming selections. The sanctuary sound system was completely revamped in 2005. Half a pew was removed to accommodate a new mixing board and computer in the back of the sanctuary to control all aspects of sound for church services, as well as the projector in the choir loft that displays announcements and hymn lyrics. The Fellowship Hall also has its own sound system, including a television and Wi-Fi. The new sound system supports the church’s music program as well. An occasional adult choir enhances the service, as does a handbell choir, which utilizes the three-octave set of bells that the church has been using since 1976. The congregation has many talented vocal and instrumental soloists. A multi-voice keyboard and organ add variety to the service. Since 2003, the praise team has supplied additional music with guitars, drums and sometimes even the washboard! Westside has always been led to do Christ’s work in the community and worldwide. Today, Westside hosts a variety of meetings and activities, including a Bible study, Bone Builders, a Family Fun Festival and Alcoholics Anonymous. The community enjoys the free breakfasts and dinners, and the perennially popular Swiss steak dinners attract many senior citizens who enjoy an evening of good food and fellowship. The congregation donates to the North Presbyterian Church food pantry and a variety of other local community outreach organizations. Border Buddies Ministries, whose missionaries are based in Honduras, holds its monthly board meetings at Westside. The church is financially supportive of this mission and also sponsors four Honduran children. Five members have made mission trips to Honduras through this organization. Another recent community event was the annual "Go Red for Women Tea.” This was held from 2013-2016 to support the American Heart Association. Informative speakers, fun music, healthy food demonstrations, and a fashion show were included, and the men of the church sported formal attire to serve tea. The women of the community looked forward to this February event, bringing Westside full-circle to when annual Teas were held in the early years. Elmira has changed considerably over the past one hundred years and those changes have required Westside to adapt accordingly. Whatever the next century brings, we at Westside still firmly believe that the Lord is in control and there is still work to be done. May future generations say, “Great was their faith. Westside Methodist Episcopal Church youth. Wesley Hall - former church parsonage at 744 W. Church St. Setting the cornerstone - 1955. 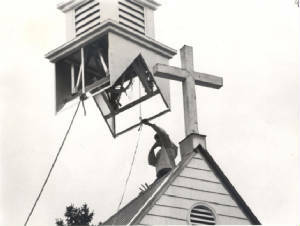 The new steeple with carillon 1983.